Helping Faculty Find Work-Life Balance gives voice to faculty and reveals the myriad of personal and professional issues faculty face over the span of their academic careers. Based on years of in-the-field research and two gender-based studies, Maike Ingrid Philipsen and Timothy Bostic give the issue of work-life balance a fresh perspective by taking a comparative approach to the topic in regard to both gender and career stage. The authors' research reports on the experiences of male and female faculty at early-, mid-, and late-career stages. 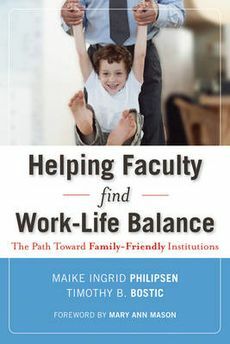 In addition, the book goes beyond the typical "family-friendly" approach and takes an all-encompassing "life-friendly" view, recognizing the need to strive for balance in the lives of all faculty members. (Review taken from the Jossey-Bass Department Chair Leadership Institute website).